New set construction picture reveals link to Prometheus. One of the images most associated with Sir Ridley Scott’s Prometheus was that image of the massive Engineer head that dominated the urn chamber within the Engineer facility. It was an image that was featured prominently during Prometheus’ marketing. 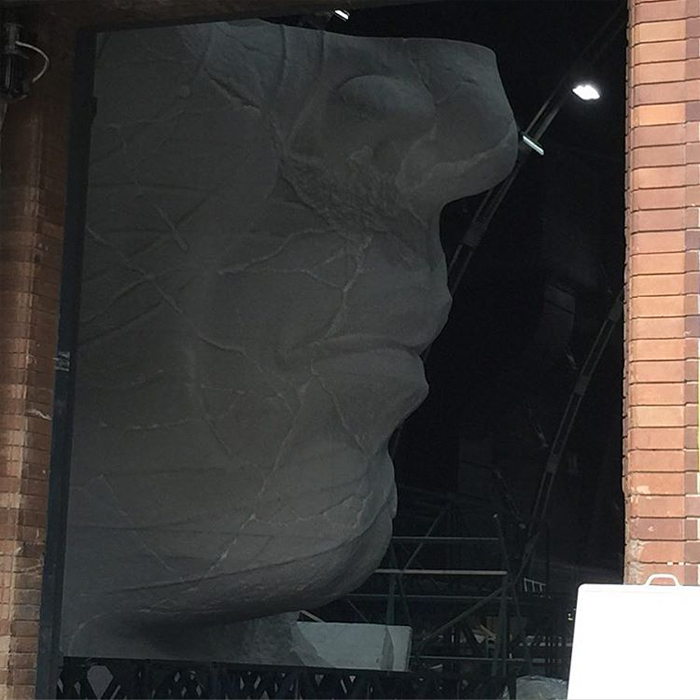 It would now appear that another giant Engineer head monument is being constructed at Fox Studios Australia where Alien: Covenant will be shooting shortly. New set construction picture reveals link to Prometheus. The image comes via Instagram user charlietong123. This is our first specific indication that any Engineer facility or architecture will be featured in Alien: Covenant. Perhaps David did discover another Engineer complex somewhere on the surface of Paradise. Or perhaps we will find the head overgrown in the depths of the green scenery? The picture has now been taken down from Instagram. Maybe we'll get some meaning for it this time. Is it just me or does fox totally not have any leak prevention or security for this production? I am starting to wonder the same thing. I'm really hoping the accelerant doesn't come into play when it comes to the Alien creation. I am quite happy we'll see some more Engineer locales though! I just hope it's more Giger-esque this time. No more stone, give me bones! Maybe we'll get some meaning for it this time. Maybe. It'd be nice to know! Is it just me or does fox totally not have any leak prevention or security for this production? Yeah, they don't seem as tightly clamped as Prometheus. At the rate the leaks are coming we'll see the movie on DVD before it's even released in theaters. Maybe we'll get to see the city of the engineers, reminiscent of Greek culture. Complete with giant statues and buildings. I'm kind of hoping the black goo was just another experiment that went awry. Maybe it should stay within the confines of Prometheus. What do you guys think? I'd definitely love to see some form of Giger-esque city. Maybe it should stay within the confines of Prometheus. What do you guys think? I'm with you there. I'd have no problem seeing no more of it. So this suggests the possibility that the Engineers may still have a presence, even though this will predominantly be a Xenomorph show. From what we've heard from Scott so far it would sound like the film will revolve around the Engineer's creation of the Aliens. Kind of hoping for a history lesson instead of mad science. The crew will likely stumble upon some long dormant eggs I bet. Ah who am I kidding I want to see that ceiling hanging alien kick things off. Well maybe not revolve around but include something about it. I just hope it's coherent, whatever they come up with. Looks very similar to the concept art seen in the Prometheus : The Art of the Film book. Ehm it wouldnt affect a xeno, why would it affect a xeno? Its most likely that the black goo is part of the creation of the xeno when its mixed with non xeno dna. And if that is the case then the outcome is already known to us, like the deacon for example. Better than using stuff we said we didn't like. Page created in 0.044 seconds with 31 queries.